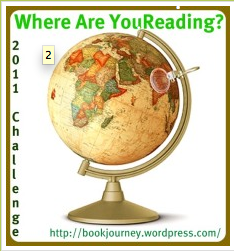 Helen's Book Blog: Challenge wrap-up: Where are you reading? Challenge wrap-up: Where are you reading? Observation--SO MANY books set in California and New York! I managed to read books from 20 different states (I haven't listed books that weren't specific as to their location). I thought I did so much better than that. Observation--obviously, I really need to work on reading books from Central and South America! Observation--I need to branch out in my Europe books. I am doing the 2014 Winter Olympics challenge in 2012 so that will help as I'll reach the nordic countries. Observation--I have a thing for Afghanistan and India, which I kind of knew. I think I did well for reading books set in a variety of Asian countries. Observation--This coming year I am hosting the Middle East Reading Challenge again so I hope to broaden my reading of this region.